What comes to mind when you think of tai chi and qigong? Peaceful older generations cycling through slow, steady maneuvers, "hippies" practicing these same subtle movements in a group, classic kung fu movie masters trying to teach their apprentices...? 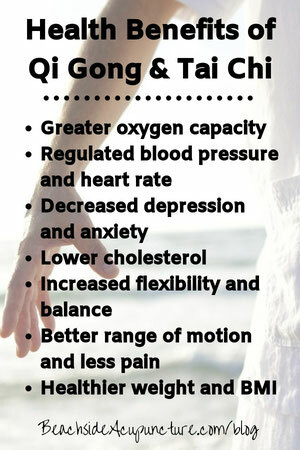 Tai chi and qigong are medicinal, meditative, gentle exercises designed to stimulate the circulation of qi and blood through the body's meridians and can be practiced anywhere by anyone! 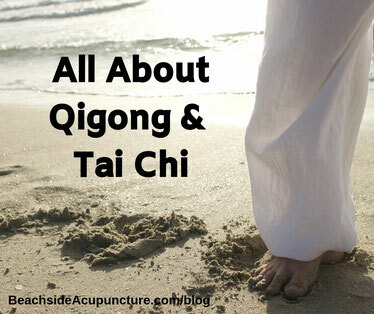 While we're talking about tai chi and qigong as a pair, in reality they're a bit different. Tai chi is a routine composed of specific movements that blend into each other, almost like a very controlled and fluid dance number. It takes memorization at first as a beginner practices one sequence until it becomes second nature, and then adds the next sequence and so on. Learning from a teacher is a great option because he or she can correct your form as you follow along, but there are also tutorials online. The goal is to learn the movements so well that the body can flow through them without much conscious thought, making the practice of tai chi meditative even in its controlled activity. Deep breathing and balance are integral in tai chi, as every small step and change in position should be as slow and relaxed as possible. It may take some time to learn, but once your body and mind become accustomed to it, you can use it to immediately clear out your mind and accumulate major health benefits over time. Qigong, on the other hand, is a bit more liberal in that it encompasses a variety of exercises that can be used in different combinations. You can easily search YouTube or Google for qigong videos designed with specific intentions in mind - i.e. qigong to wake up in the morning or qigong for the immune system - and you can usually find routines to fit any amount of time. After a while, you may find that your body responds best to certain movements and develop your own individualized qigong practice as well. Just like tai chi, your eventual aim should be precision, steadiness, and peace, which may seem contradictory at first but can blend seamlessly together with time.